Cinema on the High Street. 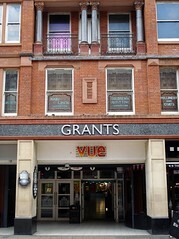 According to Cinema Treasures, it opened as the Warner Village Croydon Grants in May 2002, and was renamed to Vue in April 2004. Existence last checked in January 2017. Last edited 2019-01-24 14:59:08 (version 14; diff). List all versions. Page last edited 2019-01-24 14:59:08 (version 14).